The Chocolate Hills are a group of unusually shaped hills located in the middle of the island of Bohol in Philippines. This extraordinary landscape is unique to this small island. It is unknown how many chocolate hills there are. It is known that at the bare minimum there are 1268 hills but some estimates put this number as high as 1776. The hills are not huge; the highest one barely reaches 120 meters in height. Even so, most hills are between 30 and 50 meters. The conical Chocolate hills are scattered within a fifty square kilometer area. Mystery still surrounds how the Chocolate Hills were formed. One of the more popular local legends is that long ago, two giants fought for days, hurling earth and stones at one another, until they fell exhausted, friends once more, into each other's arms. More romantic is the handsome young giant, Arogo, who fell in love with a mortal woman. When, as mortals must, she died, the giant wept, his great teardrops turning into the Chocolate Hills. However geologists have differing views about how these hills were formed. One plausible theory is that they are weathered formations of a marine limestone lying on top of an impenetrable clay base. Whatever their origin, being in their presence is a surreal experience, and as landscapes go, one of the most bizarre you can encounter. At the end of the dry season, the famous hills earn their name when the grass turns from green to brown. At all times, they retain a uniform look as, curiously, no trees or clumps of shrubs will grow on them. The chocolate hills can be visited anytime of the year as they will be just as spectacular during the rainy season as during the dry one. However take into consideration that the hills cannot be climbed individually and there is only a viewing deck from where you can marvel at the scenery around. Keep in mind that the viewing deck is accessible by stairs and temperatures can be hot sometimes, especially in the rainy season. Usually visits to the hills are short ones as there is not much to be done besides viewing them. However, after you leave them, there are plenty of other things to do in the island of Bohol. 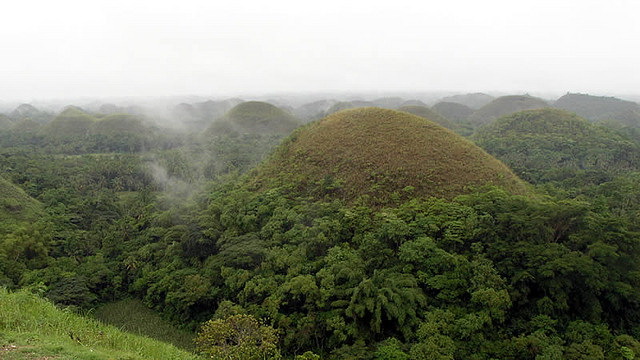 Since 1988 the Chocolate hills are Philippine’s third National Geological Monument. It was also submitted to be a UNESCO World Heritage, however the submission was not yet approved.